Cuba is the first nation in the world to answer an urgent call for personnel to help stop the spread of Ebola in West Africa and will send 165 medical professionals to Sierra Leone, one of the three countries most affected by the virus, next month. The announcement was made last Friday by Dr. Roberto Morales Ojeda, Cuba’s Minister of Public Health, at a news conference at the headquarters of the World Health Organization (WHO) in Geneva, Switzerland. Although other countries have pledged money or supplies, Cuba is the first to offer its most valuable asset and what is most needed to combat Ebola: well-trained, experienced doctors, nurses, and other health care experts. It is reported that the United States will follow Cuba’s lead as President Barack Obama is expected to announce plans to send 3,000 military troops to Liberia to supervise building of treatment centers and train medical staff. Cuba’s decision is consistent with a long history of solidarity with other developing nations, particularly those facing crises. 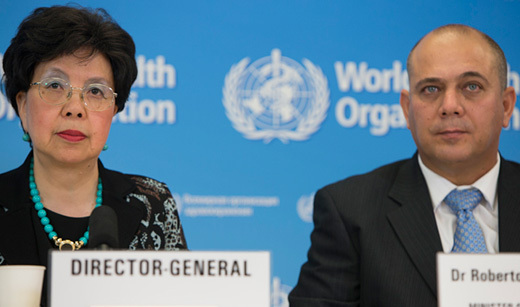 Indeed, the WHO’s Director, Dr. Margarat Chan, not only praised Cuba’s contribution to fighting the Ebola crisis but its larger role in providing medical care to millions around the world. “Cuba is world famous for its ability to train outstanding doctors and nurses and for its generosity in helping fellow countries on the route to progress,” she asserted. Chan thanked Cuban President Raul Castro and upheld Cuba’s experiences in emergency situations as a model for other countries to emulate. During the devastating 2010 earthquake, for example, hundreds of Cuban medical workers were sent to Haiti, and many remained there to provide health care. At present, there are over 50,000 Cuban health care professionals working in 66 countries, including 2,500 doctors in 32 African nations. One of the most celebrated programs is “Mission Miracle” in Venezuela, where Cuban doctors have performed thousands of cataract operations and also run clinics in poor urban neighborhoods and rural communities. Cuban doctors were already working in Sierra Leone when the Ebola outbreak began in December 2013 in Guinea. The crisis has overwhelmed the three neighboring countries of Guinea, Liberia, and Sierra Leone. There have been a few reported cases in Nigeria and Senegal, although it appears transmission of the virus has been brought under control in those nations. Over 2,400 people have died from the virus and at least 4,900 more are known to be infected, although WHO officials and others have suggested those numbers are drastically underestimated. Moreover, the disease is spreading rapidly, there are insufficient facilities to treat those infected, and health care workers have died in disproportionate numbers. The three most affected countries have only recently emerged from political crises – in the cases of Liberia and Sierra Leone, decades of civil war – and already lacked adequate health facilities and personnel before the crisis. These factors, combined with prevalent poverty and widespread illiteracy, make controlling the Ebola outbreak a seemingly impossible task. In addition to the human toll, the crisis is crippling agricultural output and mining activities, the primary sectors of the sub-region’s economies. Ebola, but few have followed through with their commitments. The Cuban team consists of health care professionals who have experience working in countries facing natural disasters and disease outbreaks and includes 100 nurses, 50 doctors, three epidemiologists, three intensive care specialists, three infection control specialist nurses, and five social mobilization officers. The team is now receiving special training in Cuba and will spend six months in Sierra Leone working in Ebola treatment centers and community clinics across the nation. Photo: WHO’s Director, Dr. Margarat Chan and Dr Roberto Morales Ojeda, Cuba’s Minister of Public Health, at the announcement that Cuba will send a medical team of 165 people to Sierra Leone to help in the frontline in the Ebola response efforts. WHO/M. Missioneiro.